Here is a quick pattern you can follow to have your charms.reactive handlers correctly triggered on config changes. While likely fine for simple charms, the problem with the above example is that there is no guarantee that this handler will be run first in the hook. Other handlers whose conditions are met may be run before it, and these handlers may fail if they rely on update_config() having been run and the charm configuration change acted on. Here the handler is guarded by two flags, and both need to be set before the handler runs. The config.changed flag is only set for the duration of the Juju hook that first sees the configuration change. If the apt.installed.postgresql flag is not also set during that same hook, then the handler will not be run. Triggers are checked at startup and after each handler is run. Their original intention was to allow better communication between layers, so that when for example the apt layer sets the ‘apt.installed.postgresql’ flag, a trigger could immediately set a flag specific to your layer and avoid any period where the layer specific flags were out of sync with the apt layer flags. In the previous example, the trigger will fire before any handlers have run. After a charm configuration change, a hook will run and the trigger on the config.changed flag will be immediately fired, clearing the app.configured state immediately. No handlers will run that are guarded by @when(‘app.configured’). And the app.configured flag will remain set until the apt.installed.postgresql flag is also set and the update_config() handler actually run, even if that doesn’t happen until several hooks in the future. 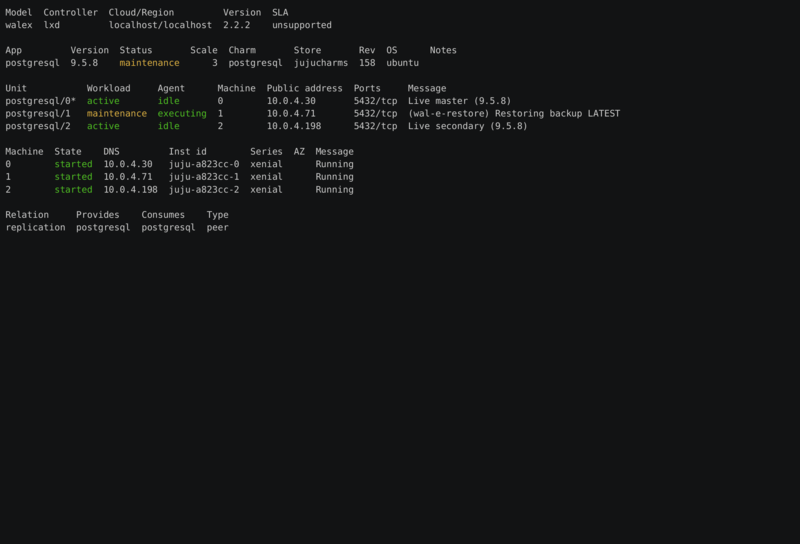 Cross model relation support has been added to the PostgreSQL Charm for Juju, best experienced with Juju 2.3 or later. When clients also support this feature, you can split your deployment across multiple models, even across controllers and clouds. Making a charms.reactive client charm support cross model relations should involve nothing more than rebuilding and publishing it; the PostgreSQL interface has also been updated and knows how to use the new ingress and egress address information and its API is unchanged. The main reasons for splitting your deployments into multiple models this way are to spread out parts of your deployment to other availability zones or clouds, or when different teams are maintaining different parts of a complex deployment (e.g. connecting developer maintained clients to DBA maintained back ends. Here is a brief walk through connecting clients to a server across continents. This example is using two AWS regions, but this works just as well with other supported clouds (Azure, GCE, OpenStack, etc. ), and between cloud providers. First, I’m going to bootstrap two completely independent Juju controllers. Most sites will use a single HA Juju Controller for production, with multiple controllers only desirable when there are independent regional teams needing to maintain independent infrastructure. - i-0fae2f267c2a3c0aa (arch=amd64 mem=2G cores=1)ap-southeast-1a"
- i-097eedbeaec354996 (arch=amd64 mem=4G cores=2)ap-southeast-2a"
Application "postgresql-client" endpoints [db] available at "admin/client.client-db"
There are several different ways to connect the client and server models together, but for PostgreSQL you should make an offer from the client model, and consume it in the server model. This is because Juju cross model relations are anonymized to avoid namespace clashes and other edge cases; the units in the client model will not know details about the model they are connected to. These details are irrelevant to most charms, but the PostgreSQL charm uses the remote application name to ensure that, when models are redeployed, that the same database credentials are used and the client units are redeployed with the same access to data that they had before. By consuming the offer made by the client model into the server model (and not the other way around), we can control the client application name seen by the PostgreSQL charm and the normal redeployment and disaster recovery processes work as expected. WARNING! This command will destroy the "rightsaidfred" model. ERROR cannot destroy model "rightsaidfred"
command again with the "--destroy-storage" flag. without destroying it, use the "--release-storage"
For the record, I normally wouldn’t be so brash as to destroy the old model before bringing up the replacement. A better approach when dealing with production data is to put the PostgreSQL database into backup mode and duplicate the storage volume (exactly how depends on your cloud provider or bare metal setup). You would then proceed to bring up the new deployment with the duplicated filesystem, while leaving the original deployment in place in case you need to back out the migration. Continuing, build the new deployment in a new model. First, the master database reusing the destroyed master’s storage (pgdata/0, vol-0bbe053869187f9c6). importing "vol-0bbe053869187f9c6" from storage pool "ebs" as storage "pgdata"
At this point, it is important to wait for setup to complete. If we attempted to bring up a second unit right now, there is a chance the second unit would be anointed the master; it would depend on which AWS VM happened to spin up and complete initial setup first. And that would be bad, as a new, empty database would be replicated instead of the one on the attached storage. Now, it is safe to add a new unit. importing "vol-0a95d56991e1dff1b" from storage pool "ebs" as storage "pgdata"
Future charm work is expected to make migration stories even easier, with Ubuntu 18.04 (Bionic) support and the latest version of PostgreSQL. pg_rewind will avoid unnecessary database cloning. And logical replication should allow major version upgrades, bringing up a new PostgreSQL deployment in parallel with a live deployment and cutting over. Databases should not lose data, but we still have to plan for recovery. We make logical backups when we can, exporting the database to SQL (pg_dump). Even terabyte sized databases can be dumped daily. But as databases become bigger, logical backups are becoming more of a luxury; they require long running transactions, and can take an impractical amount of time with multi-terabyte databases. Binary backups are becoming standard. An inconsistent backup of the filesystem is made, along with the Write Ahead Log (WAL) files needed to repair the inconsistent backup. While generally larger in size, the backup process is less resource intensive on the database. And if you keep archiving the WAL files as they are produced, you have the option of Point In Time Recovery (PITR). 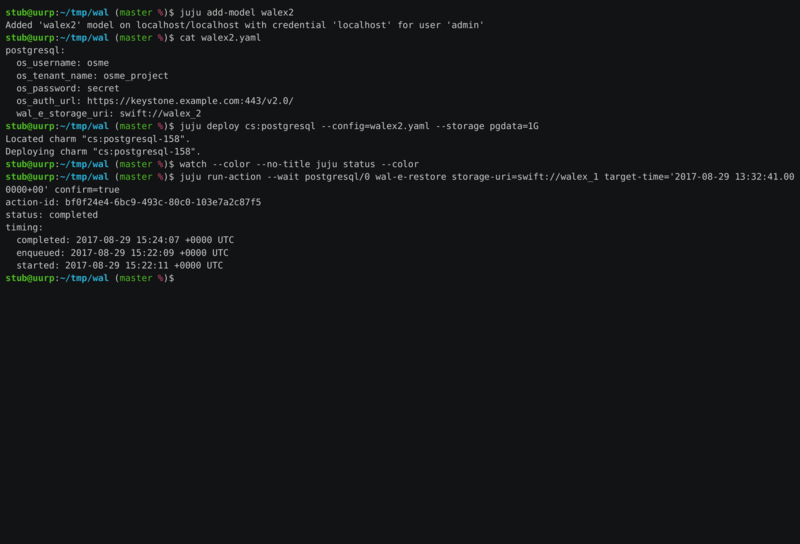 Deploying PostgreSQL with Juju simplifies the process of making and restoring PITR backups. The PostgreSQL charm uses the WAL-E tool for binary backups, WAL archiving and PITR. It stores the backups in cloud storage, supporting OpenStack Swift, Amazon S3, Azure WABS and Google Cloud Storage. I’m using it in production with OpenStack Swift, and I’m interested in hearing about experiences from others using other cloud storage options. N.B. While the charm creates the Swift container automatically, with other storage backends you may need to create it manually using the cloud native tools. WAL files by themselves are not terribly useful. We need a filesystem level backup of the database to apply them to. 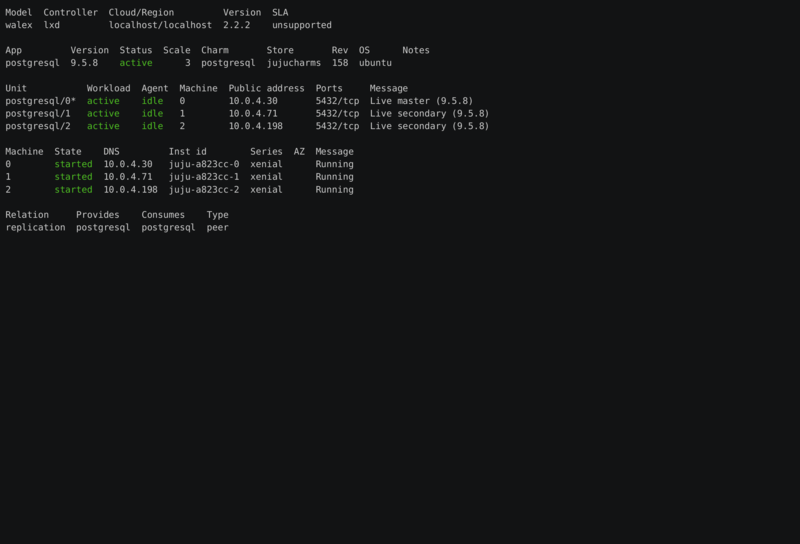 We could wait for cron to kick off the regular job, but it is even better to run it right now. There is a Juju action to do just that, which must be run on the master unit (as reported by juju status; it will not always be the first unit). The action runs WAL-E, which streams a copy of the database and necessary WAL files directly to cloud storage; unlike the charm’s logical backup support, you do not need to worry about having enough disk space on the unit to store a copy of the database. Now let’s do a PITR on a fresh unit in a new Juju model. This is another default deploy, with the same configuration except for the wal_e_storage_uri setting. Every service must use a unique bucket, or they will collide and your backups are at risk. 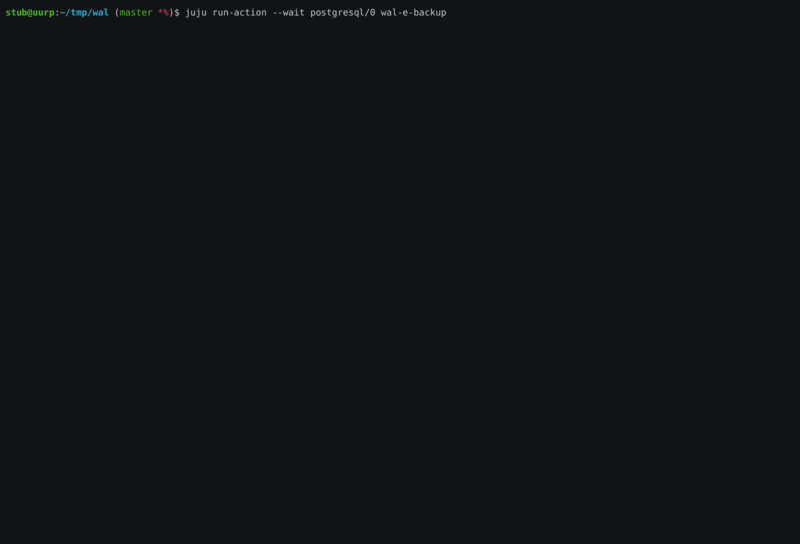 As you can see, making and restoring PITR backups with Juju is very straightforward. Juju actions abstract the complication involved in this process and allow us to encapsulate operational knowledge in the charm itself, making your operations playbooks simpler. We just hope you never actually need to use it.